Evergreen Cemetery began its life in the winter of 1856 with the death of James Thomas’ baby girl. The infant, only 10 days old, died in February, her mother Elizabeth would follow that October. 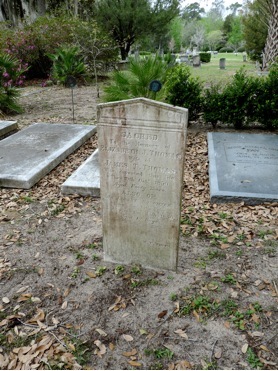 The grave, shown below, is marked by an elegantly simple headstone carved by W.A. White of Charleston. Since this humble beginning thousands of souls have found their final rest at Evergreen. Among those are dozens of notables who have shaped our local, state and national history. Now known as “This Wondrous Place” we welcome you to visit Evergreen and to take a walk with history.